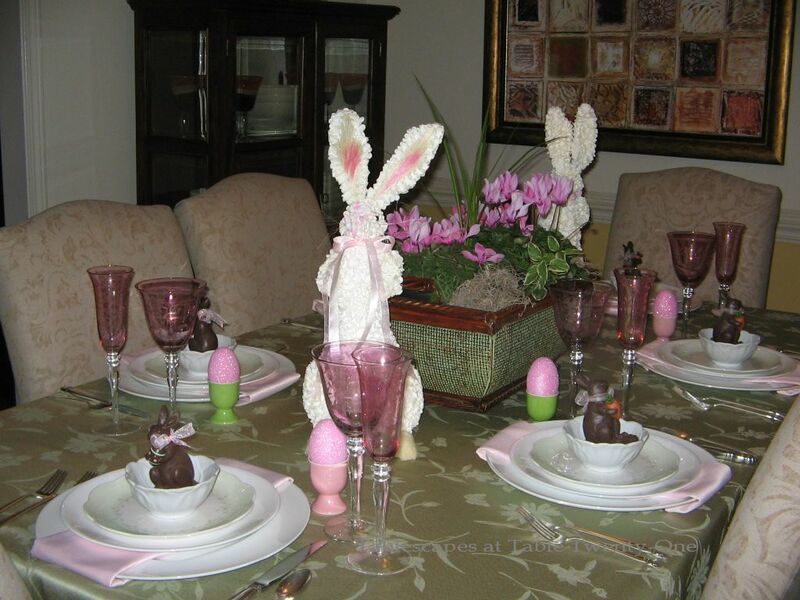 My best friend – a gal whose decorating style might best be described as eclectic – asked me to create a “simple” Easter brunch/luncheon tablescape. Simple, huh? You guys are killin’ me with the “simple” tables!!! I love to load a table up, make it groan under the weight of all the pretty eye candy. Why, oh why must I create a “simple” brunch tablescape??!?!?! It’s just not natural!!! OK…I’m finished whining now. Without further ado, I present to you a “simple” Easter brunch/luncheon tablescape that, by the way, is pretty cost-effective to duplicate! 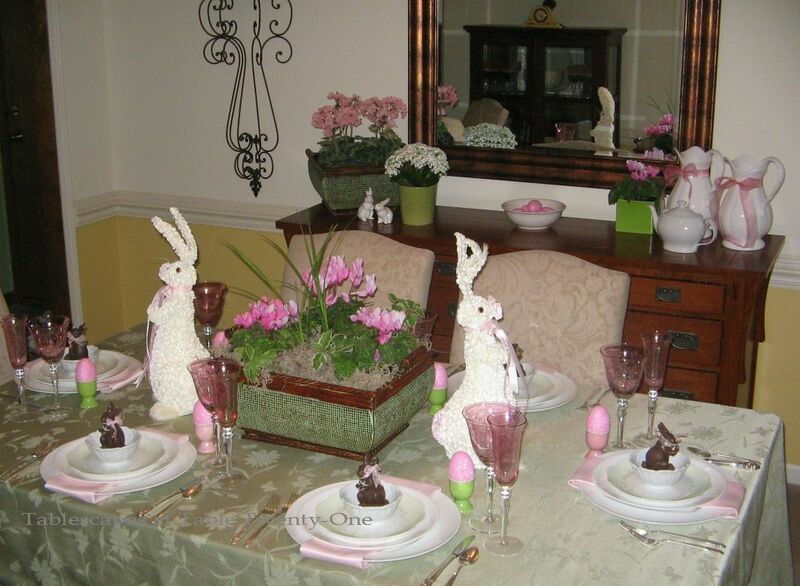 The simplicity of this Easter brunch tablescape starts with the repetition of a specific element: Easter bunnies. I started with a soft pistachio “Spring Meadow” table linen from Bed, Bath & Beyond. It has an almost damask look about it which created a bit of formality without getting too stiff. 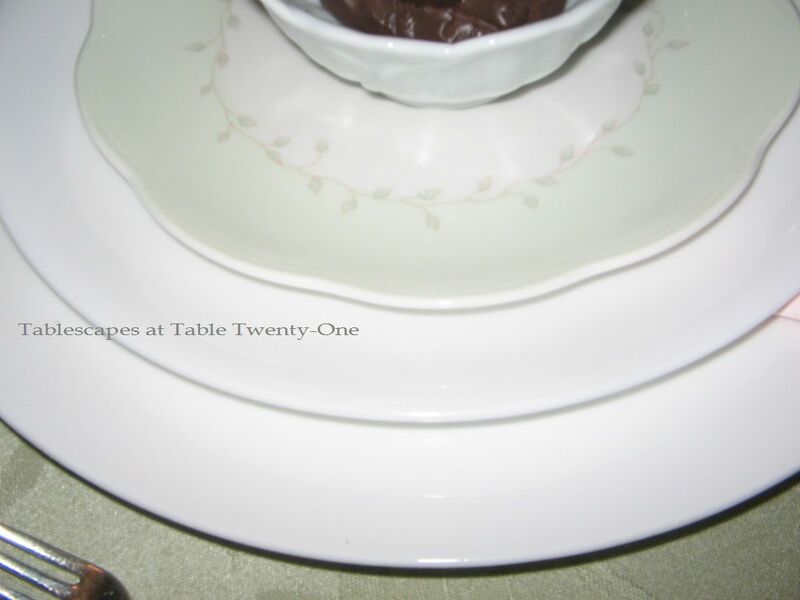 Each place setting starts with a white ceramic charger, topped with a soft pink napkin to create a color buffer between the charger and the white Corelle entrée plate. The salad/dessert plate is Lenox “Butterfly Meadow – Swallowtail”. A white ceramic floral bowl that will be used for the inevitable fruit compote starter is from Pier 1. I found these realistic faux chocolate bunnies at Hobby Lobby several years ago. Of course, the real thing will work just as well and serve as a perfect take-home treat for young and old alike. This is the way it all stacks up. 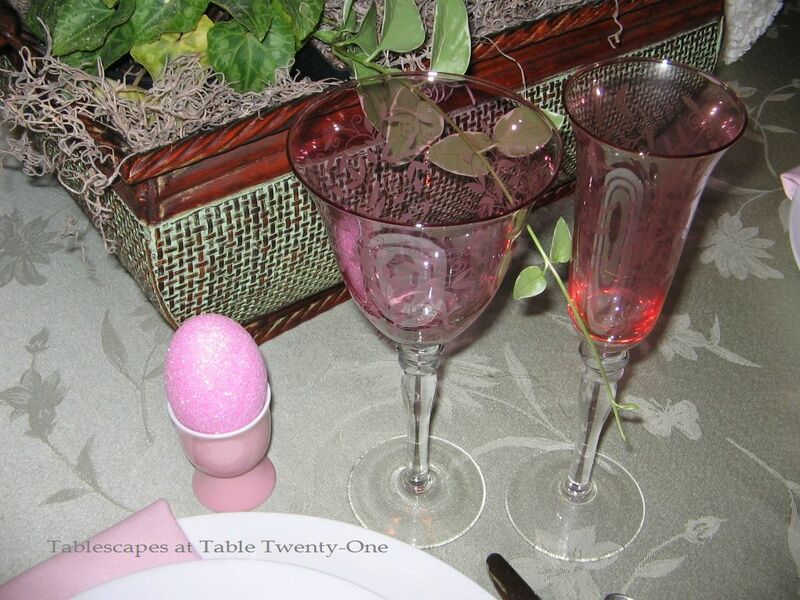 Because I was tickled with the pink on the centerpiece bunnies, I wanted to play that color up as a predominant accent for this tablescape. This pink tinged stemware works beautifully and dutifully for serving juice and mimosas. 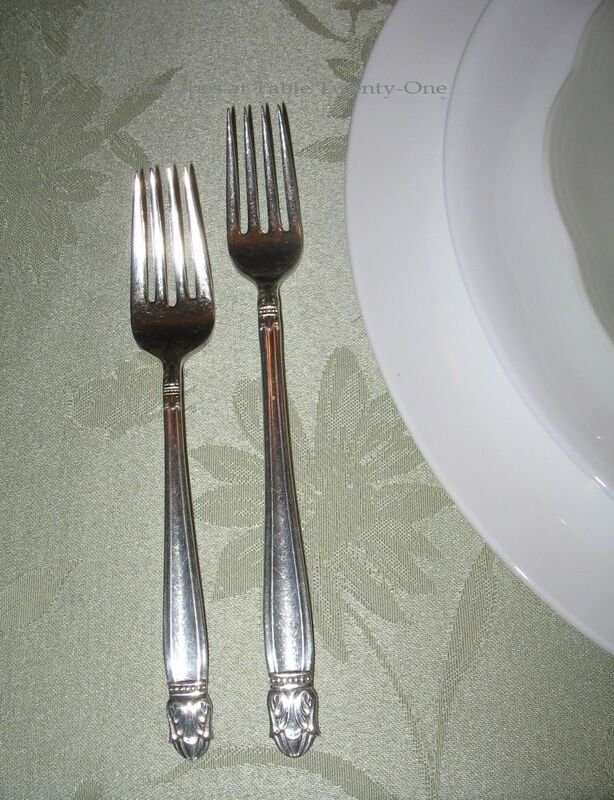 “Danish Princess” silverplate flatware is formal but approachable. A “simple” table doesn’t always have to mean wholly unadorned. I bought these ceramic egg cups in several different pastel colors last year from Crate & Barrel. They are great for displaying colorful Easter eggs! Here I use eggs that are of the same color and have been decorated alike to add a bit of (repetitive) consistency around the table. I found these adorable paper hydrangea Easter bunnies at Village Gardens in Blue Springs, MO. I love the pink in their tails and ears! 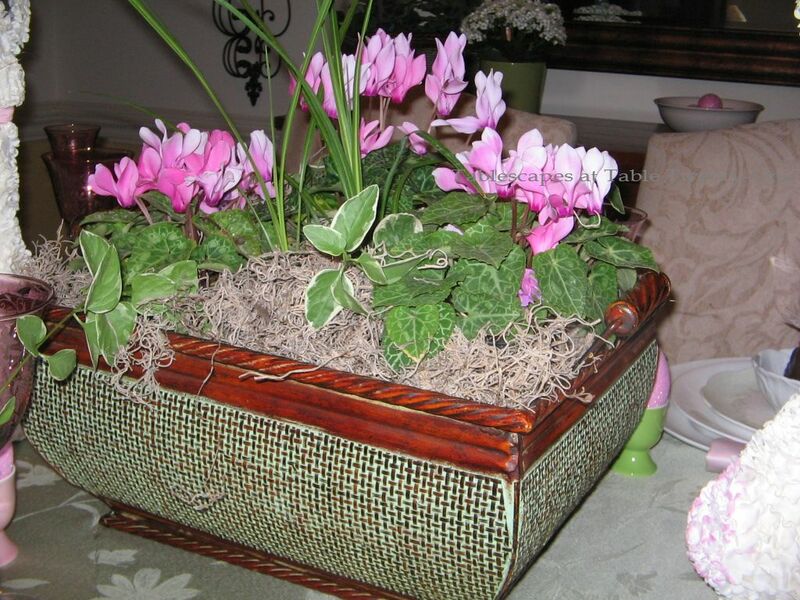 I created the hefty centerpiece using brilliant pink cyclamen, sinewy Vinca vine, and fun spikes that will later be planted in my flower garden. The flowers, all still in their nursery pots, are nestled into a metal basket and covered with Spanish moss to hide the mechanics. I like the mix of textures and shapes. The flowers in the centerpiece coordinate with those on the buffet. 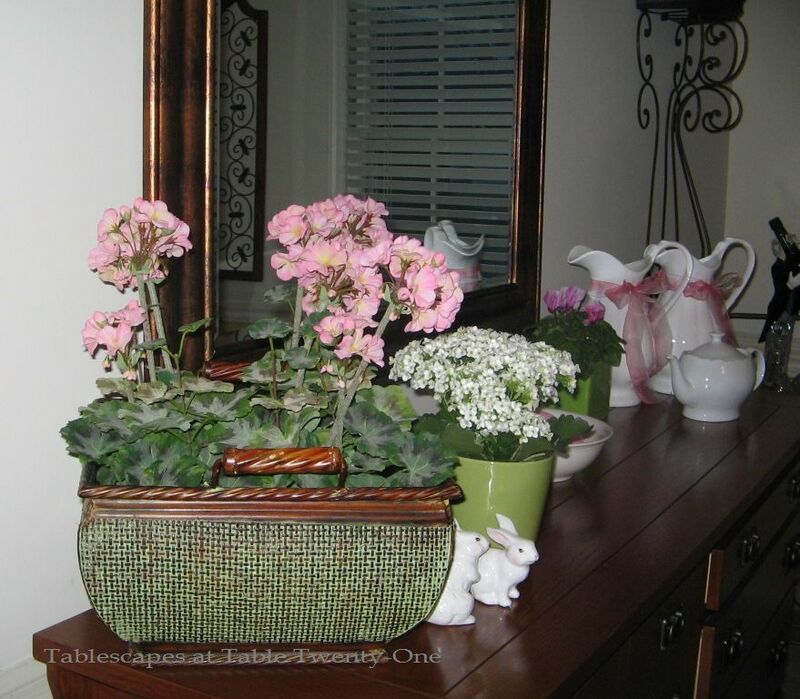 While the soft pink geraniums (tucked into another green metal basket) and frosty white kalanchoe are not the same flowers used on the table, they readily complement them. Elements that “complement” trump those that strictly “match” any day of the week in my decorating book! Get double use out of these flowers by planting the geraniums in beds or pots outdoors for summer long color. The kalanchoe – available in red, pink, yellow or white – are colorful, highly textural, easy care indoor succulents. 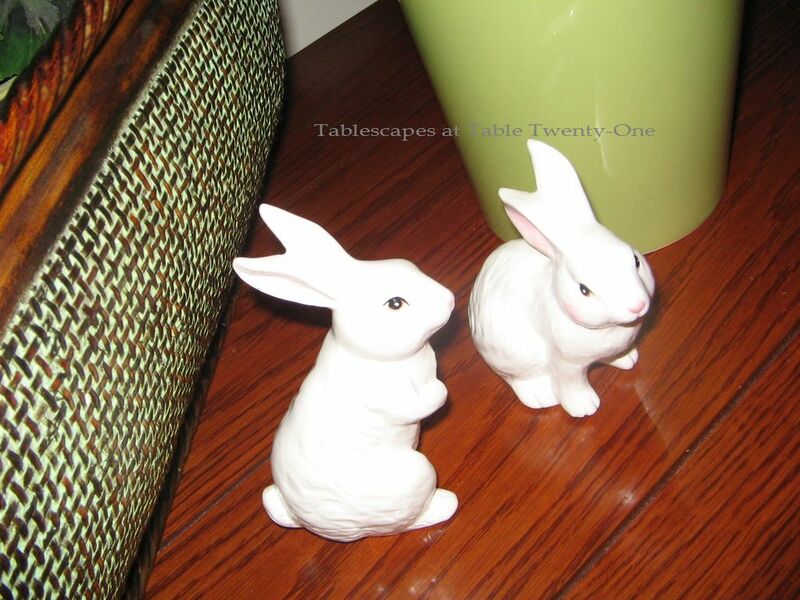 These cute ceramic characters extend the bunny theme from the table to the buffet. 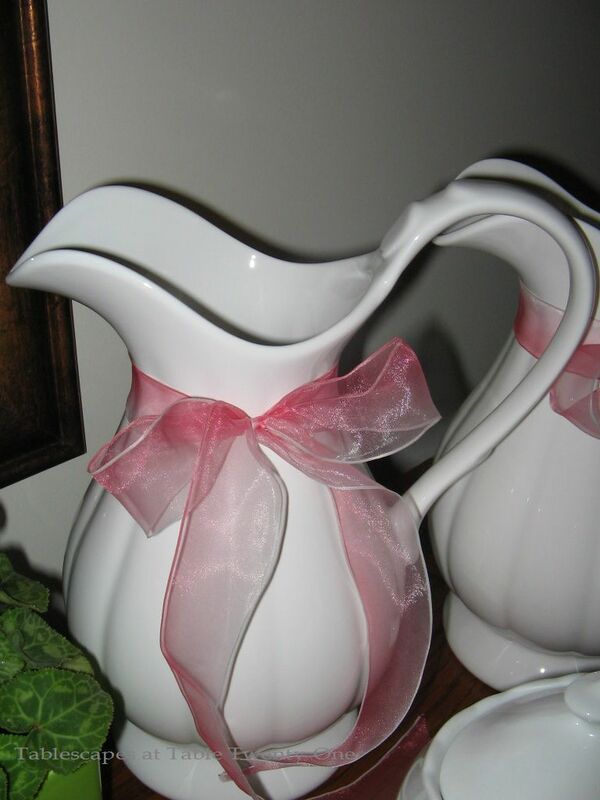 Creamy white pitchers for serving mimosas and juice are tied in with the table bunnies’ pink bows. This ombre ribbon, edged in white, has hues ranging from the deepest pink in the cyclamen to the softest in the napkins. 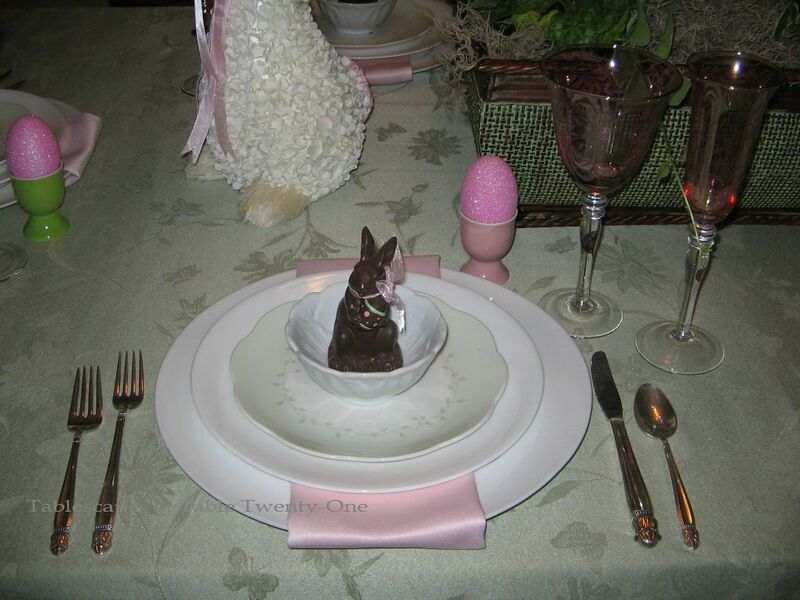 Ribbon is an inexpensive way to extend a color scheme, especially for an Easter table. So there you have it! A “simple” spring tablescape for an Easter brunch or luncheon that can be easily mimicked with items you may already have at home. As for you, sweet Sheri, you can always borrow it all if you want! I’m joining Susan at Between Naps on the Porch again this week! Check out what a bunch of talented ladies & gentlemen are up to in the world of tablescaping! Okay, Alycia, this table is adorable. Simple, really? I love those really really cute bunnies. I saw some but by the time i got to them they were all gone! Your hints of pink on the table are perfect keeping the table looking fresh and lively. The tablecloth is perfect! I just love it all. I love using plants as centerpieces! They then do double duty when they go outside. What great ideas you’ve shown us once again. Your everlasting chocolate bunnies are so cute! Thanks so much for sharing with us. Hi, Marlis! Glad you like it. I really kind of struggled with it. I had to keep editing. I really do have trouble with simply constructed tables. I like to keep adding, so it is torture to have to keep taking away!!! Hello, my hoppy friend! 🙂 Easter Blessings to you, too! I am looking forward to Easter Sunday and being with my family. I’m going to email you something in a little while. Hey, Linda! Girl…you and I are SO born of the same “Adonis DNA” and “Tiger Blood”!!! 🙂 It just seems so foreign to me to subtract from a table!!! I am happy with how it turned out, though. Sheri is happy, too, and that’s all that really matters in the end. My goal is to help people with THEIR individual style, regardless of my own preferences. It’s actually kind of fun to stretch like that! “See” you tomorrow! Love this tablescape. Green, pink, and white are one of my top favorite color combinations. I especially love the pink stemware, the Danish Princess silverplate, and those lovely white pitchers. This tablescape just screams SPRING! Hi there, Bella! Green, pink & white are one of my top favorites, too!!! I LOVE it! My Mom’s sorority colors are crimson & cream, and their rival sorority’s colors are pink & green. Imagine how upset my Mom gets with me for making all her events pink & green! 🙂 🙂 🙂 I don’t really do it on purpose…I just love the color combo! Thanks for stopping by! I really appreciate it! Sweet and lovely! 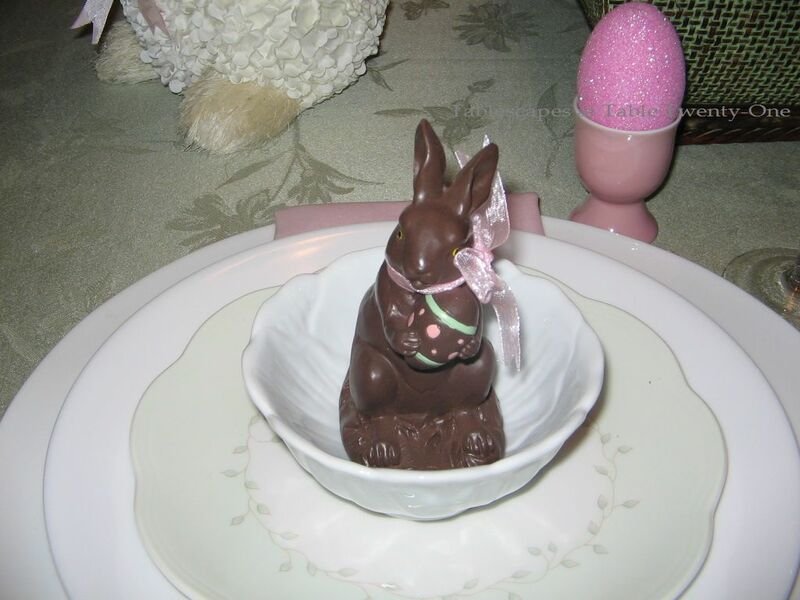 I especially love the little faux chocolate bunnies. That Sheri is a girl after my own heart, though. While I appreciate the multiple components of the tablescape design, I also like a spare look. You did a beautiful job here, Alycia. Hey, Joan! Yeah, yeah, yeah….I know it: You and Sheri are cut from the same cloth! 🙂 It’s all good! I actually do appreciate a sparse look, too. It’s just so much harder to make it look good! You would think the opposite would be true. Hmmmmm. Oh, well! Thanks for stopping in!!! 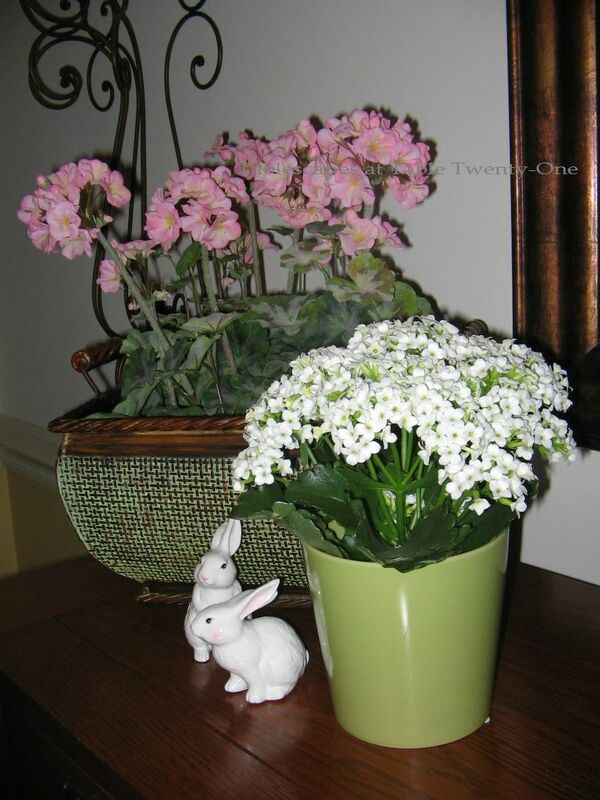 Alycia~ I love your paper hydrangea bunnies standing at attention at your table! 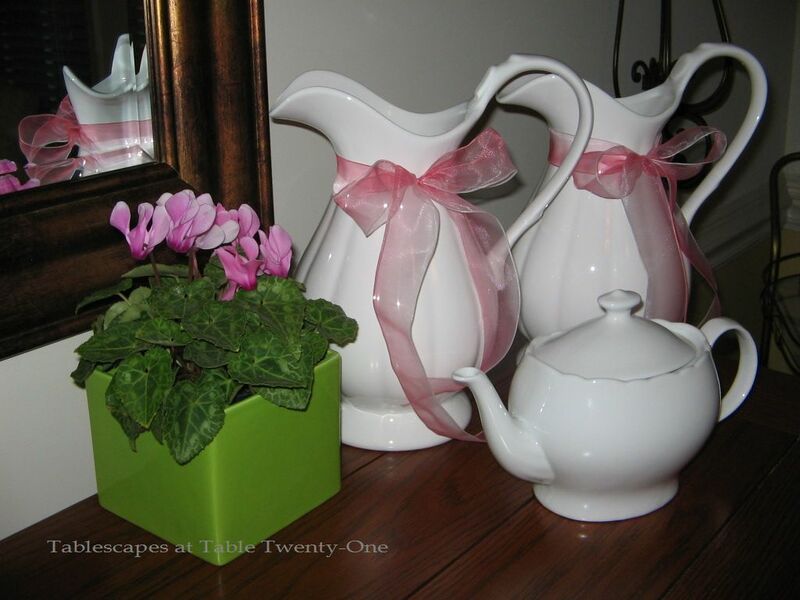 Your tablecloth is the perfect canvas for your Easter table and I appreciate your special touches…the ribbons on your pitchers, flowers on the table & sideboard, and faux bunnies in your bowls! Simply lovely! Love it, the soft pink and green are so Easter! I think I have that same cloth. Love those bunnies! And the stemware is so pretty too! Hope you are 100% better. I missed you visiting last week. Hi, Kathleen! Yes, I am 97% better, so that’s about as good as I can expect for awhile! I’m grateful for that much! Thanks for stopping by. I just visited your place. I am a follower, but I don’t get email updates. Am I doing something wrong? Lovely table. It’s great how the bunnies tower over. And the pink tinge to the glasses is lovely. Beautiful table, Alycia! It just sings Spring and Easter. The paper hydrangea bunnies are fabulous! Love those faux bunnies in your bowls! A super great table! Hi, Debbie! Thank you!!! I really like those bunnies. They’re all crunchy rather than soft like a real bunny, but they’re fun! Hope you have a fun weekend! Lovely table, Alycia…the stemware is beautiful. Cute, cute, cute bunnies! I love your table with white and pink, such great elements you’ve use to create such perfect design. I love your centerpiece! The paper hyandrea bunnies are so cute. The bunnies on your plates are also darling. Thank you for sharing Alycia! Love the bunnies and table turned out fab. Your ideas and mine of simple run along the same track I see! Since I love pink and green, you know I think this is gorgeous. I need to find some of those bunnies. So gorgeous! 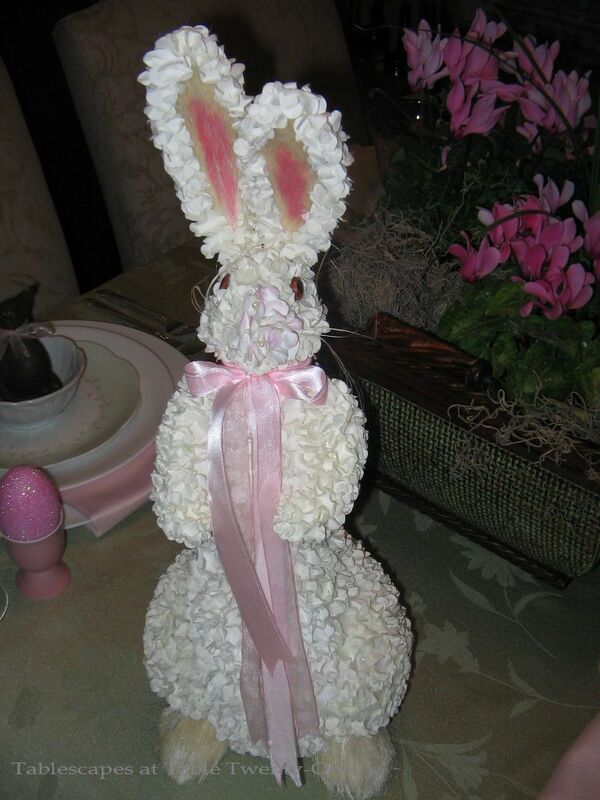 I love the soft colors, and the faux chocolate bunnies and the paper hydrangea one are adorable! I really like the pink stemware, too. I often tie a ribbon on one pitcher to differentiate the sweet tea from the unsweetened. Hi, Tricia! That’s a great idea for marking the sweet tea! Wow…when my husband and I visited the South, I was blown away by just how sweet the sweet tea is! After all these years of Equal or Sugar Twin, that was quite a jolt! 🙂 Thank you so much for stopping by, and have a fantabulous weekend!!! Okay, you will definitely have to take me to Village Gardens on my next trip to town. This is absolutely beautiful, but simple. I love it, I love it, I love it. i love this! so pretty and fresh…the sideboard is really beautifully done! Hi, Donna! Thank you so much! I did this table as an example for a friend, but I need to start thinking my OWN Easter table!!! It’s right around the corner! I hope you have a good weekend!!! I have to tell you that I just love, love this table!! The way you folded the pink napkins across the chargers looks so nice; I’ve never seen them done that way before. And I am SO loving those paper hydrangea bunnies! They are some of the cutest bunnies I’ve ever seen. I’m a person who loves pinks, so I know that’s why I found this table so appealing. It’s pretty, whimsical, and Easter-ish all at the same time. Now last, but not least, please visit my blog because — guess who else has Lenox “Butterfly Meadow” on their table this week. You guessed it-me. I finally got a chance to do Tablescape No. 3. I bet your friend is very happy with her Easter table; you scored a home run again. I’m so glad you like it, Denise! Sheri liked it, too! She and I have been best friends since we were 6 years old (we are now both knockin’ on 53’s door!). I aim to please! I just left your blog. I have been SO slow these past 2 weeks making it around to all the tablescapes! (Yes…I try VERY hard to look at each & every one each week!) The last 2 weeks have been super busy and a little weird, so I’m off track. I’m so glad you stopped by, and I was REALLY glad to see the pretty table you did this week. Welcome back, baby! Check ya later!!! I knew you would have the perfect table for the season. I would love to have your glassware to use with my mother’s china. Tieing the pink bows around the bunnies necks was just the right tie in. Good job….again! Hey there, Linda! Thanks for popping by! Thank you so much!!! I found that stemware at TJ Maxx last year. I wish I could find more of it for a set of 12 each. Don’t know the maker or anything, though. If I find out, I’ll let you know. That information has remained elusive to date. I’m not sure yet what I’m going to do for our own Easter table…or if I’m even going to do Easter brunch or dinner this year! It’s kind of up in the air right now. I hope so, because it would be fun to do another Easter table! Hi, Sarah, and thanks! 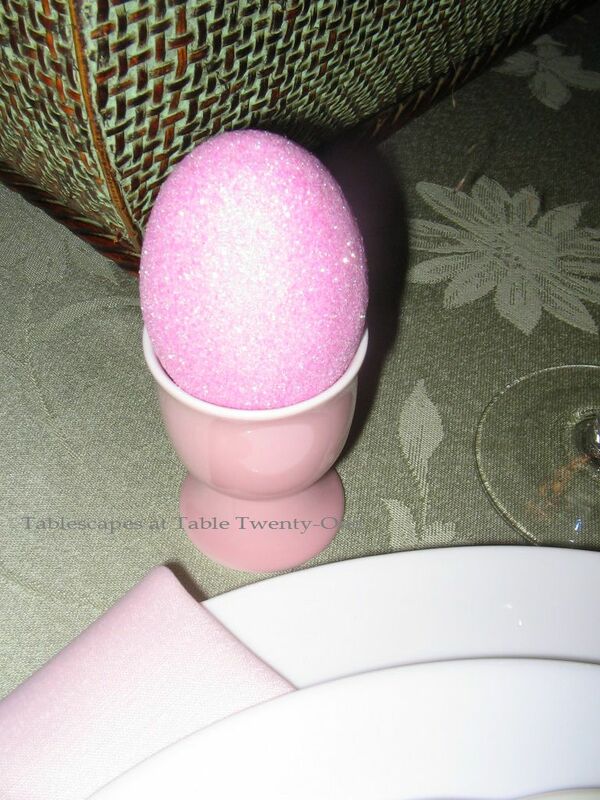 I am still trying to figure out what I’m going to do for our actual Easter table, too. We have a lot going on here, and I need to focus, focus, focus!!! I know yours will be fabulous, and I’m looking forward to seeing it. Take care, and thank you for stopping by!! !